Added by zol zol 9 months ago. Updated 9 months ago. When I add a certain .cue file, audacious reliably crashes. I drag the .cue file from a file manager into the playlist window. I attached the .cue file. 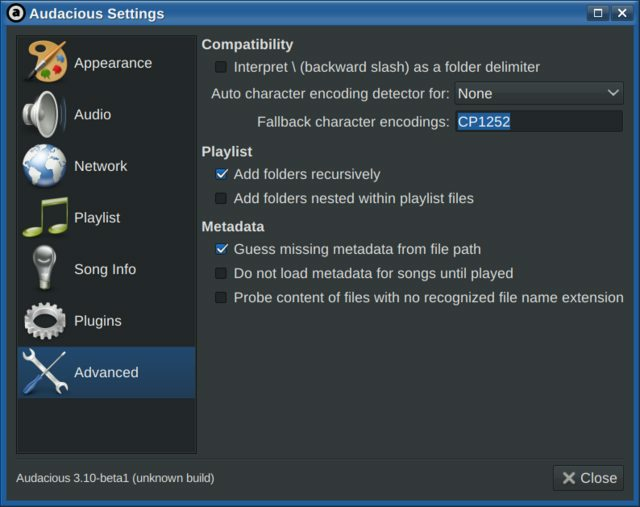 It doesn't seem to matter if the rest of the actual song files are in the same directory, it crashes regardless for me. Please attach the backtrace (as a separate file). Reading symbols from audacious...(no debugging symbols found)...done. Thread 6 "audacious" received signal SIGSEGV, Segmentation fault. 63 ../string/strstr.c: No such file or directory. To get the cuesheet to load correctly, you should add 'ISO-8859-1' to the list of fallback character encodings (File -> Settings -> Advanced -> Compatibility). This is the default setting, and in general, removing 'ISO-8859-1' from the list is a bad idea. (File -> Settings -> Advanced -> Compatibility). For the OS system settings? I don't think linux mint has a fallback option. I see. I don't have advanced settings entry on my audacious settings page so I thought you were talking about something else.